(Bloomberg) -- Fitch Ratings isn’t convinced that the European Central Bank’s balance sheet expansion has come to a full stop. 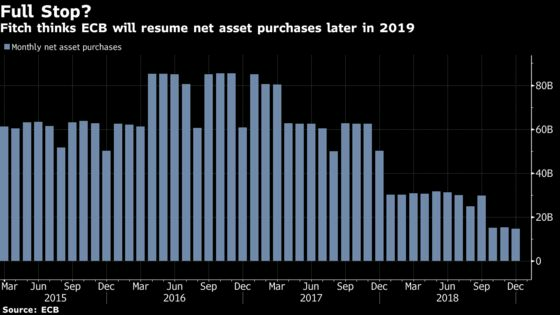 A sharp slowdown in the euro-area economy and ensuing downward pressure on inflation will likely force the institution’s hand in resuming net asset purchases later this year, Fitch economists led by Brian Coulton said in a note on Wednesday. Officials halted their 2.6 trillion-euro ($3 trillion) program at the end of 2018, just before the region took a turn for the worse and caused the ECB to lower its outlook. ECB President Mario Draghi was asked at his latest press conference whether officials had discussed recommencing quantitative easing. He said there had been no talks on the matter, but that “optionality is everywhere” and decisions taken so far have been right and adequate.